Vijayaraghavan's Cricket Blog: ICC. T.20.WC-2012. Gr.1. Super 8. Match 14. West Indies vs England. ICC. T.20.WC-2012. Gr.1. Super 8. Match 14. West Indies vs England. An opening stand of 103 in 10.2 overs between Chris Gayle and Charles, powered West Indies to a match winning 179 for 5 in twenty overs. Gayle made a power packed 58 of 35 and Charles, who was subdued in the first six overs, blasted his way thereafter for 84 in 56 balls. Broad was the most successful bowler with 2 for 26. Swann, Dernbach & Finn, picked up a wicket each. for the loss of three wickets. Thereafter, Hales 68 of 51,who was batting well, was joined by Morgan and West Indies were taken apart for 107 runs in 9.4 overs and almost took England through. Hales fell at 162, and England could finish at 164 for four to lose the match by 17 runs. Morgan remained not out on a blistering 71 of 36 balls, recording the fastest fifty in WC.T.20-2012. Badree bowled an economical spell of 4.0.20.0. 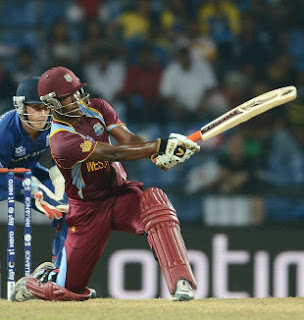 Apart from Rampaul 4.1.37.2, Chris Gayle and Samuels picked up a wicket each. England, which came in to the tournament with the reputation of top.T.20 team is struggling with just one victory against Afghanistan in Group stage. Will they recoup ? Only the coming days will tell.